This is a rectangular Fry’s Chocolate porcelain sign. This particular Fry’s Chocolate sign is blue and white. 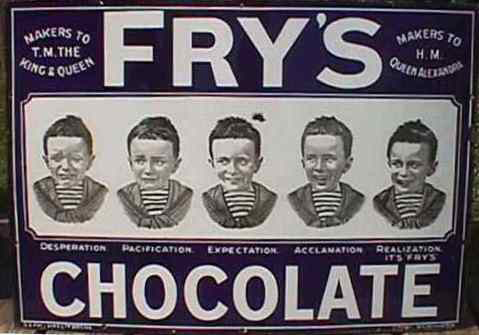 It reads, “Makers to T.M The King & Queen, Makers to H.M. Queen Alexandria, Fry’s Chocolate, Desperation, Pacification, Expectation, Acclamation, Realization Its Fry’s” and features five pictures of a young boy facial expressions in the center.